KPI represents graphical overview of all the mappings' records processed through HubBroker platform. This KPI report indicates the ratio of the successful mapping records vs failed mapping records. Means, If you have 100 mapping records a month and out of 100 there are 95 successful records then this KPI indicates 95%. Ex. If there are 95% successful mapping records in the month which is higher then the target (90%) set in the settings, then KPI will indicate success(Green color). This KPI report indicates the ratio of the failed mapping records vs successful mapping records. Means, If you have 100 mapping records a month and out of 100 there are 5 failed records then this KPI indicates 5%. This KPI report indicates the ratio of the transactions received to your destination gateway within the specified time interval. Means, If you have 100 transactions a month and out of 100 there are 95 transactions reached within the time interval(10 Minutes) set in the settings, then 95% transactions are on time. Ex. If there are 95% on time transactions in the month which is higher then the target (90%) set in the settings, then KPI will indicate success(Green color). 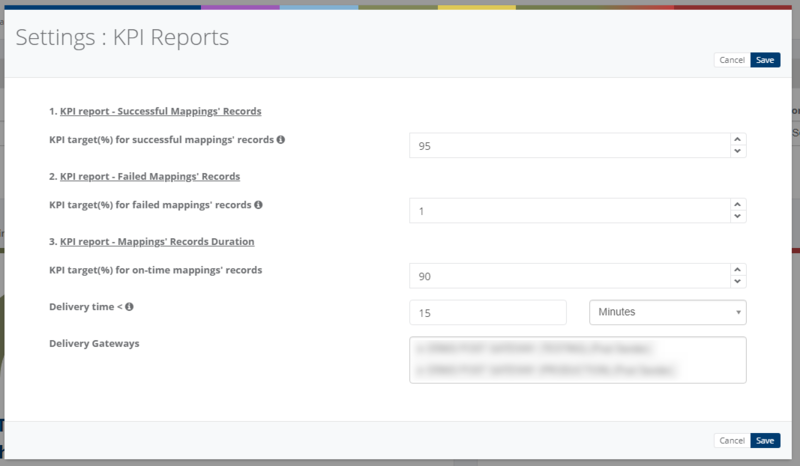 This KPI report shows the time duration between the mapping request and mapping delivery time for all the mappings in your account. You can filter the report based on the below criteria. Delivery Status: On-Time, Delayed, Pending. On-Time: If the duration is less than 3 days, then it will be an On-Time delivery. Delayed: If the duration is greater than 3 days, then it will be Delayed delivery. Pending: If the mapping is in progress, the status will be pending for that mapping.